Monday September 10, 2018 - Nairobians were treated to drama at City Hall after their Members of the County Assembly stormed Speaker Beatrice Elachi's office and demanded her ouster. 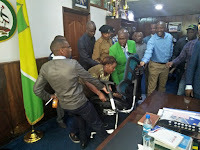 The irked MCAs made their way into the office where Elachi was holding an interview with a local station and attempted to literally eject her out of the office. The MCAs were accompanied by their supporters into the office shouting "Elachi Must Go!" However, the commotion by the MCAs almost degenerated into blows as Elachi stood her ground while some of her workers panicked and watched in fear. 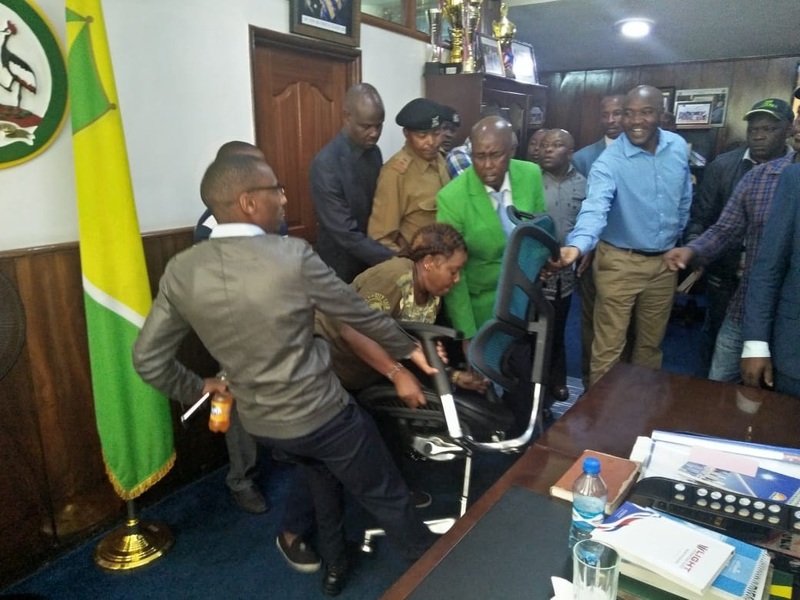 It took the intervention of the police who lobbed teargas canisters in the ensuing fracas at City Hall as the MCAs attempted to evict the speaker from office following her controversial impeachment last week. Last week, the MCAs impeached Elachi with six counts of allegations among them using public money to undergo plastic surgery in the US. But Elachi was later reinstated by the court.